These are like the road runner of snakes – they are super fast, thin, and agile. They can climb trees and bushes faster than any other snake I’ve seen, and they are wicked fast on the strike. Yesterday I saw one strike so fast I couldn’t see it. That’s fast. These are very common snakes here in Thailand, they are definitely one of the top 5 snakes you are likely to see in this country. On average I see 1-2 a week – without looking for them. They are constantly snaking across the roads. I have given chase about a dozen times and was only fast enough to catch them 4 out of 12 times. Once they hit the green brush – forget it man – they are impossible to find or catch if you do see them. So, best chance to catch this snake is on the road if you can jump off your motorcycle or out of your vehicle fast enough. 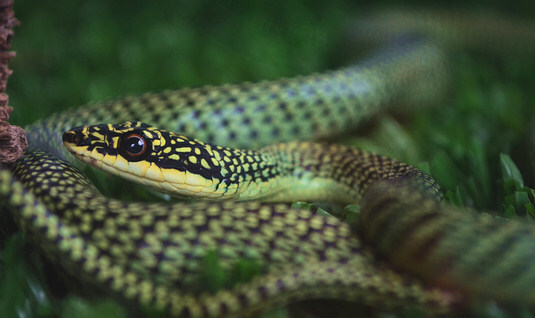 These snakes bite fast and often, and they do have venom, but the venom is only toxic to frogs, lizards, and other small animals – not usually humans. If you happen to be allergic to the venom, you could still go into shock, though I’ve not seen any cases of this in the literature. Many, many thanks for this website which is extremely useful and well-written. Have used it to identify the 2 snakes I have seen here so far in the last 3 months. They were, I am pretty sure now an Indo-chinese Rat Snake and a very beautiful Golden Tree Snake. The latter in particular was breathtakingly beautiful and elegant! It really took my breath away and excited an interest in snakes. I will in future, use this website to educate the ownner and his wife about not killing the snakes they find on the property, which unfortunately I am told, they have done in the past. In addition, I shall steer all the guests towards it when they arrive here, particularly at the orientation meetings. You are more than welcome to come and stay here for a few days free of charge, during which time hopefully you could share a little bit of your local snake knowledge with us! Best to release it in the exact place you found it because many snakes die when not released at the same spot. Cheers!